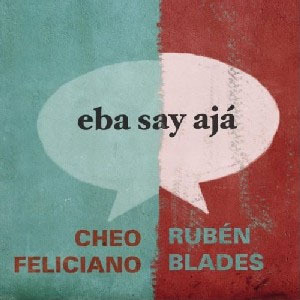 After many years of being together during that poignant period when the powerful and contagious sound of Joe Cuba was playing everywhere, Rubén Blades and Cheo Feliciano are back with a wonderful salsa album called Eba Say Ajá, a title that comes from the Spanglish expression ¡Everybody say ajá! It took seven years to release this work because of the many musical and social activities that Mr. Blades and Mr. Feliciano have been involved in. But the waiting was justified and they have collaborated the best of their brilliant talent and experience on this album full of rhythm, feeling, romantic and smart lyrics. 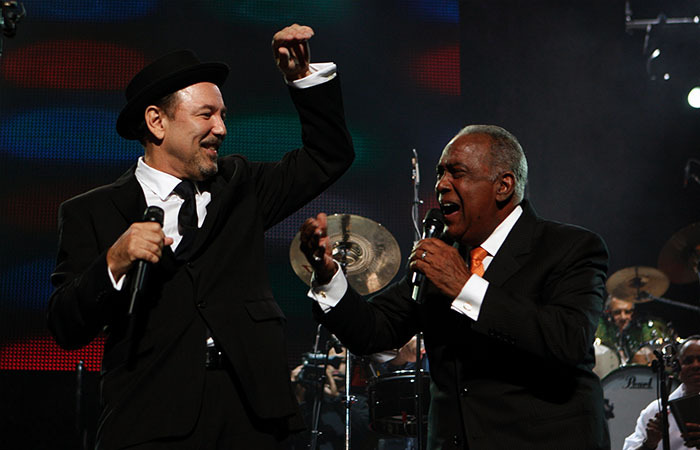 Just imagine what you can listen to and appreciate in terms of playing and performance from these two living legends of the salsa genre. Cheo Feliciano, the superstar of Joe Cuba´s sextet participating as a vocalist on 17 albums with this band in the 50´s and 60´s, and later becoming one of the best Latin singers on the New York scene. Rubén Blades, the virtuous singer and advanced composer who has won 8 Grammy awards, participated in 35 Hollywood movies and created a unique and modern sound of salsa music with his famous band Seis del Solar. With a dream team of musicians including Louis García, Felipe Fournier, Georgie Padilla, and Luis Marín among others, Eba Say Ajá is a musical diamond consisting of twelve songs produced for demanding listeners and eager dancers. Mr. Blades and Feliciano selected their favorite songs from each other to be sung. Cheo sings five of Blades´songs including “Dime”, “Juana Mayo”, “Manuela”, “Sin tu cariño” and an unpublished one called “Inodoro Pérez” composed exclusively for this project by the Panamanian composer. On the other hand, Ruben sings five of Feliciano´s songs including “Nina”, “De aquí pa’ allá”, “Franqueza cruel”, “Los entierros”, and “Busca lo tuyo”. Two tracks were sung by both; “Si te dicen”, a sentimental bolero, and “Lo bueno ya viene”, a powerful cha cha cha. There is no best song on this album, all of them are masterpieces in themselves. One beautiful track Ruben sings from Cheo’s repertoire is “De aquí pa’ allá”. The song starts with a fine-tuned group of back up singers and a majestic and sentimental phrasing of the vibes, a perfect introduction that invites Mr. Blades to sing in his particular and unique vocal style. The arrangement of the choir and the syncopated structure enhance this work and pay tribute to the first version of it. The surprise in this work, of course, was the new song “Inodoro Pérez” which Rubén composed for Mr. Feliciano who sings it with mastery and feeling. This song, full of tumbao and montuno roots, is a reflection about people who do not like to work but criticize others. This is one more creative critique infused in lyrics that Mr. Blades wrote to make the salsa dancer enjoy the clave and, at the same time, reflect on the real problems of our society. Every song is a tribute to the singer who made it popular in those golden days when clave-based music started to take over the planet. No doubt this album is and will be a classic forever in every Latin music lover’s heart, and there is no doubt that this work is a reunion of two genius salsa musicians. While you are dancing and singing to every second of this album, do not forget to shout out some of the pregones that Cheo and Rubén call out in their songs like “Familia!” (family) and “Se Puede!” (you can). Tracks: Nina; De Aquí Pa Allá; Dime; Franqueza Cruel; Inodoro Pérez; Juana Mayo: Lo Bueno Ya Viene: Los Entierros; Manuela; Busca Lo Tuyo; Si Te Dicen; Sin Tu Cariño. 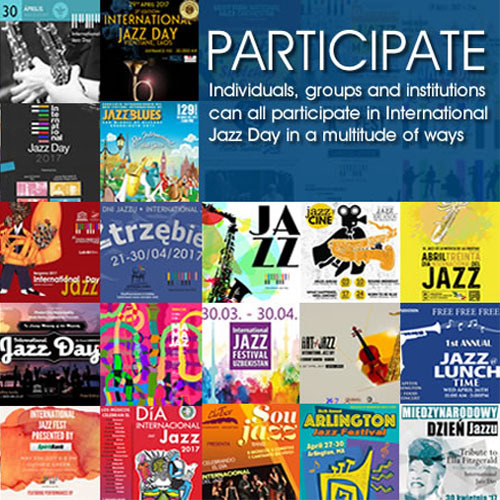 Personnel: Luis Marín: Piano and vibes; Felipe Fournier: vibes; Raúl Rodríguez: vibes; Charlie Sierra: timbales, bongó, percussion; Richard Carrasco: bongo; Albert Machuca: bongo; William “Cachiro” Thompson: congas; Georgie Padilla: congas; Louis García: tres; Pedro Pérez: bass; Darvel García: back up singer; Wichi Camacho: back up singer; Chegüi Ramos: back up singer; Primi Cruz: back up singer.